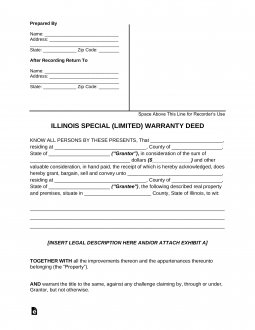 The Illinois special warranty deed is used to convey property from one to another in Illinois with a limited warranty. This type of deed is basically somewhere in between a quitclaim, which conveys no guarantee and a warranty deed which conveys full warranty to the title. A limited warranty deed certifies to the buyer that the seller has not transferred any interest other than what he has disclosed, to anyone while he or she has been in possession of the property. However, the seller does not guarantee the absence of any other claims against the property that may have arisen before grantor held the property. Again, it is always important to complete a title search, whether you have a guarantee or not, so that you know what is being conveyed and what you are paying for. Step 1 – Fill in the name and address of the person selling the property (or the grantors) along with their marital status. Step 2 – Include the amount of money to be paid for the property. Step 3 – Enter the name and address of the person buying the property. Step 4 – Write in how the buyer intends to hold the property. Step 5 – Carefully include the description of the property, including the street address and the legal description of the property. Step 6 – Write in any restrictions on the property, such as easements for utilities. Step 7 – Fill in the location of the previous deed. Step 8 – Execute the document in the presence of a notary public and have the buyer record the original with the county recorder of deeds as soon as possible.